Ozarks Sports & Outdoor Expo Turkey Calling Contest March 24th! 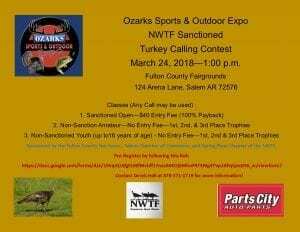 A Turkey Calling Contest will be a part of the Ozarks Sports & Outdoor Expo on March 24, 2018 at the Fulton County Fairgrounds, 124 Arena Lane, Salem Arkansas. The contest is sanctioned by the Spring River Chapter of the National Wild Turkey Federation and will start at 1:00 p.m. in the Hickinbotham-Miller Exhibit Building on the fairgrounds and awards will be provided by Parts Pro/Parts City in Salem Arkansas. There will be three classes: (1) Sanctioned Open with a $40 entry fee with $100 percent payback, (2) Non-Sanctioned Amateur and (3) Non-Sanctioned Youth, up to 16 years of age. The Non-Sanctioned classes will not have an entry fee and 1st, 2nd, and 3rd place trophies will be awarded to the top callers in each of the two classes. Any turkey call can be used. 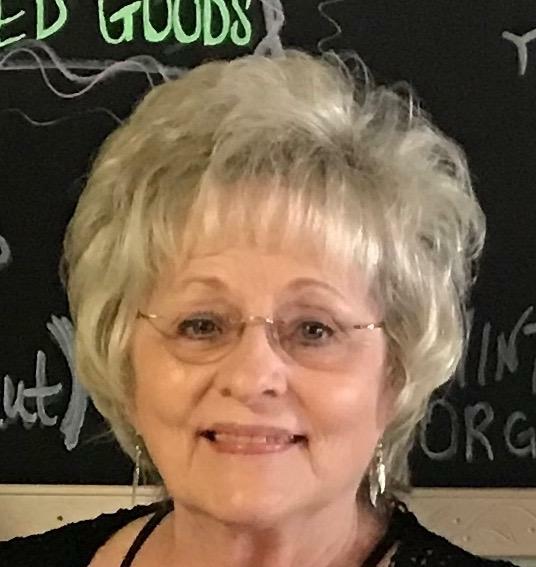 Callers are encouraged to pre-register by going to the Fulton County Fair website, www.fultoncountyfair.org, and following the link or by calling the Fulton County Fair Office at 870-895-5565. For additional information on the Turkey Calling Contest, contact Derek Hall at 870-371-1719. 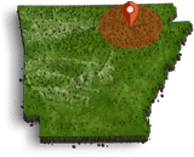 The Ozarks Sports & Outdoor Expo is presented by DHFArchery Range of Bull Shoals, Tri-County Farm and Ranch of Ash Flat, and W.R.D. Entertainment of Batesville. Other sponsors include, KSAR, Kool 104, and 98.3 The River, Areawide Media, Mark Martin Chevy of Ash Flat, Razorback Archery, ATL Special FX, Pond Pro, K-Kountry 95 and E-Communications, Leon’s Automotive, Arkansas Game & Fish Commission, and Arkansas Bow Hunters Assoc. In addition to the Turkey Calling Contest, the event will feature a High School Trap Shoot Competition, a Fishing Derby for youth age 4-12, a 3-D Archery Shoot, Gardening and Wildlife Seminars, and lots of vendors. Competitions will get underway at 9:00 a.m. The Arkansas Game & Fish Aquarium will be on display and they will be demonstrating Cleaning and Cooking Fish. The Izard County Stick Shooters will have the Hoverball Archery Game set up for the kids. A variety of food vendors will be set up on the fairgrounds. Check out the Ozarks Sports & Outdoor Expo Facebook page or the fair website for more information. Bring the family and plan to spend the day in Salem, Arkansas and visit with the vendors, be a part of the competitions, and attend the seminars. Contact the Fulton County Fair Association, or the Salem Chamber of Commerce for more information on the expo.